DC fans are getting a double dose of Diana Prince in this summer's Wonder Woman standalone movie followed by this Thanksgiving's Justice League ensemble. What better way to celebrate both movies than with a photo of Wonder Woman on the Justice League set. 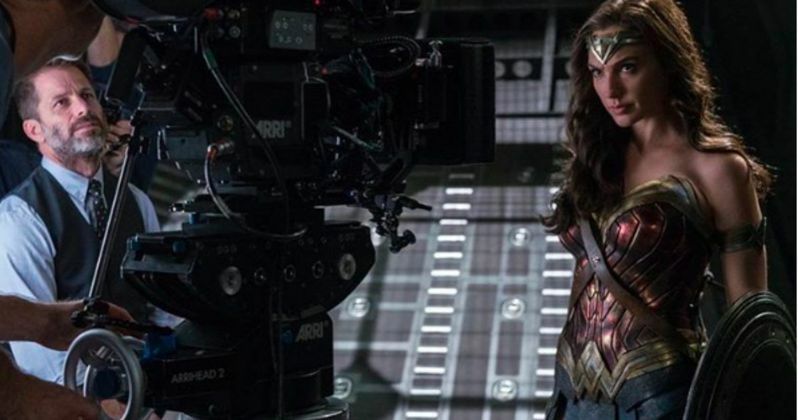 Star Gal Gadot shared this latest behind-the-scenes image to wish her director Zack Snyder a happy birthday. She says this on Instagram. "A very happy birthday @cruelfilms #zacksnyder 43 !!!! This photo expresses how focused and centered we were on JL but doesn't show all the good laughs and great fun we had!!! I wish you the best of luck, health and happiness. You are such a special talented man with such a unique cinematic vision. I'm happy I got to know and work with you! Happiest bday to you !!!" Some may have a laugh at Gal pointing out the serious look on everyone's face in this image. We've seen the cast and crew having fun on set, so there is no doubt that it's not all business behind-the-scenes. But for a long while DC Films had a reputation for delivering movies that adhered to a strict 'no jokes' rule. That resulted in the overly serious moment between Batman and Superman discussing the fact that their mothers share the same first name becoming unintentionally hilarious. No, DC Films is taking a slightly different approach, bringing in some much needed humor starting with The Flash when it comes to this upcoming slate. That said, Wonder Woman looks like it won't have too much time for laughs. As the synopsis states, before she was Wonder Woman, she was Diana, princess of the Amazons, trained to be an unconquerable warrior. Raised on a sheltered island paradise, when an American pilot crashes on their shores and tells of a massive conflict raging in the outside world, Diana leaves her home, convinced she can stop the threat. Fighting alongside man in a war to end all wars, Diana will discover her full powers...and her true destiny. Justice League also promises to be a mostly serious affair. Fueled by his restored faith in humanity and inspired by Superman's (Henry Cavill) selfless act, Bruce Wayne (Ben Affleck) enlists newfound ally Diana Prince to face an even greater threat. Together, Batman and Wonder Woman work quickly to recruit a team to stand against this newly awakened enemy. Despite the formation of an unprecedented league of heroes, Batman, Wonder Woman, Aquaman, Cyborg and the Flash, it may be too late to save the planet from an assault of catastrophic proportions. Justice League arrives in theaters November 17, occupying the space held down by Fantastic Beasts this past holiday season. But fear not, as we'll see plenty of Gal Gadot in Wonder Woman, which is coming to theaters worldwide this summer, hitting screens on June 2. 2017 isn't hurting for superhero movies, that's for sure. Marvel also has three releases coming between now and November as well, with Guardians of the Galaxy Vol. 2, Spider-Man: Homecoming and Thor: Ragnarok all on the way. Wonder Woman, however, will be the only movie headlined by a leading lady. Which is groundbreaking in and of itself. Take a look as Gal and Zack get a little serious.